The healthcare industry at present is burdened by the globally increasing incidence of chronic ailments. The majority of these diseases are often linked with unhealthy lifestyle choices. The changing lifestyle, coupled with increased healthcare expenditure, is thus bolstering scope for the expansion of the packaging and labeling services market in the healthcare sector. Spurred by the increasing demand for anti-counterfeit drug packaging technologies, TMR forecasts the global packaging labelling services market to surge at a CAGR of 5.3% between 2015 and 2023. The market is expected to reach US$136.27 bn by 2023. TMR puts the market’s overall value at US$84.61 bn in 2014. Some of the most common types of packaging techniques used in the pharma sector include blisters, bottles, pouches, vials, tubes, ampoules, and prefilled syringes. The packaging process in the healthcare industry comprises assembling of drugs and sterilizing in the final containers, and labelling the containers correctly. Proper packaging extends the shelf-life of pharmaceutical drugs by inhibiting microbial growth. Since pharmaceutical and medical devices have a crucial role to play in ensuring public well-being, stringent policies are implemented to ascertain that the pharmaceuticals packaging comply with the highest standards of quality. The implementation of stringent policies has therefore encouraged pharma companies and medical device manufacturers to spend on R&D of advanced packaging techniques. Due to the increasing demand for minimizing environmental impact, pharmacies are now exploring green and bio-based alternatives. This calls for higher R&D expenditure. Besides this, the medical devices and pharmaceutical industry deals with highly diversified products that renders the likelihood for developing ubiquitous packaging techniques bleak. It is therefore imperative for the healthcare industry to oblige to the highest standards of packaging and labelling. This is also important to ensure the integrity of drugs. Despite gaining from favorable government regulations, complicated registration and approval processes are likely to impede the market’s trajectory. Nevertheless, the market is expected to substantially gain from the rising adoption of nano-enabled packaging in the pharmaceutical industry. Rise in demand from developing nations will also create attractive opportunities for the global packaging and labeling services market. The global packaging and labeling services market is witnessing a strong growth in the healthcare sector. Transparency Market Research (TMR) states that the demand for packaging and labelling in healthcare will increase in response to the growth of the pharmaceutical and medical device industry. Demand for primary packaging in the healthcare industry is likely to increase at a robust pace. As per TMR analysis, the primary packaging segment accounted for over 60.7% of the market in 2014. Through the report’s forecast period, the segment is projected to continue dominating the market. As with the secondary packaging segment, it is expected to exhibit a CAGR of 5.9% during the forecast period. Through the forecast period, Europe’s healthcare industry is likely to exhibit opportunities for the packaging and labelling services in abundance. The region held the dominant share of 31.3% in the global market in 2014. As per TMR analysis, the market in Europe will majorly gain from the rising number of pharma and biotech companies in the region increasingly demand for packaging and labelling services. Companies offering packaging and labeling services to the healthcare industry will also get facilitated by the rising opportunities in Asia Pacific. The top players operating in the global packaging and labeling services market include Amcor Limited, 3M Company, CCL Industries, Inc., Bemis Company, Inc., E. I. du Pont de Nemours and Company (DuPont), Sonoco Products Company, Gerresheimer AG, and WestRock Company. This report on packaging and labeling (health care) services market studies the current as well as future prospects of the market globally. The stakeholders of this report include companies and intermediaries engaged in the manufacture, commercialization, providing services of packaging and labeling such as blister packaging of tablets and capsules, etc. as well as new entrants planning to enter this market. This report comprises an elaborate executive summary along with a market snapshot providing overall information of various segments and sub-segments considered in the scope of the study. This section also provides the overall information and data analysis of the global packaging and labeling (health care) services market with respect to the leading market segments based on major packaging products, packaged products and geographies. 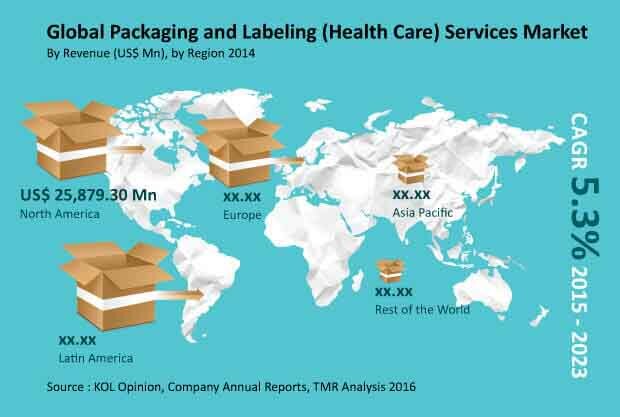 The global packaging and labeling (health care) services market has been studied based on major packaging product segments, packaged products segments, and their regional as well as national markets. Based on packaging type, the global market has been categorized into two major segments: primary packaging (blisters, bottles, pouches, tubes, others) and secondary packaging (labeling and cartoning). Based on packaged product type, the global market has been categorized into four major segments: solid dosage forms, semi-solid dosage forms, liquid dosage forms and medical devices. The market for these segments has been extensively analyzed based on their utility, effectiveness, sales, and geographic presence. Market revenue in terms of US$ Mn for the period from 2013 to 2023 along with the compound annual growth rate (CAGR %) from 2015 to 2023 are provided for all segments, considering 2014 as the base year. The market overview section of the report explores the market dynamics such as drivers, restraints, and opportunities that currently have a strong impact on the packaging and labeling (health care) services market and could influence the market in the near future. Market attractiveness analysis has been provided in the market overview section in order to explain the intensity of competition in the market across different geographies. The competitive scenario among different market players is evaluated through market share analysis in the competitive landscape section of the report. All these factors would help market players to take strategic decisions in order to strengthen their positions and expand their shares in the global market. Geographically, the packaging and labeling (health care) services market has been segmented into five regions: North America, Europe, Asia Pacific, Latin America, and rest of the world (RoW). Each regional market for packaging and labeling (health care) services has been further categorized into major national markets such as the U.S, Canada, Germany, the U.K., Japan, China, and Brazil. Market revenue in terms of US$ Mn for the period from 2013 to 2023 along with CAGR % from 2015 to 2023 are provided for all the regions and nations considering 2014 as the base year. The recommendations section included in the report would assist existing market players in expanding their market shares, and new companies in establishing their presence in the global market. The report also profiles key players operating in the packaging and labeling (health care) services market based on various attributes such as company overview, financial overview, business strategies, product portfolio, and recent developments. Major players profiled in this report include 3M Company, Amcor Limited, Bemis Company, Inc., CCL Industries, Inc., E. I. du Pont de Nemours and Company, Gerresheimer AG, Owens-Illinois, Inc., Schott AG, Sonoco Products Company, and WestRock Company.